I was reading this article which talked about the time old topic of e-books vs. physical books. By now, this argument has been exhausted. Readers are divided into those who love e-books and those who think they are the worst invention of all time (okay, that may be a bit of an exaggeration, but you get the idea). Of course, there are those who fall in the middle but they don't tend to be in the forefront of the argument. Me personally, I love physical books because they're easier for me to read–my eyes tend to get tired after reading from a screen for a little bit–and I also find that I can remember what I've read better when reading from a book than from a screen. But in my opinion, the argument in regards to the future of writing and reading is irrelevant. The people that say that e-books are ruining the future of reading are silly. E-books are just another form of reading. I think that the old fashioned printed book will never completely disappear, but even if they were to, that would not stop readers from reading. 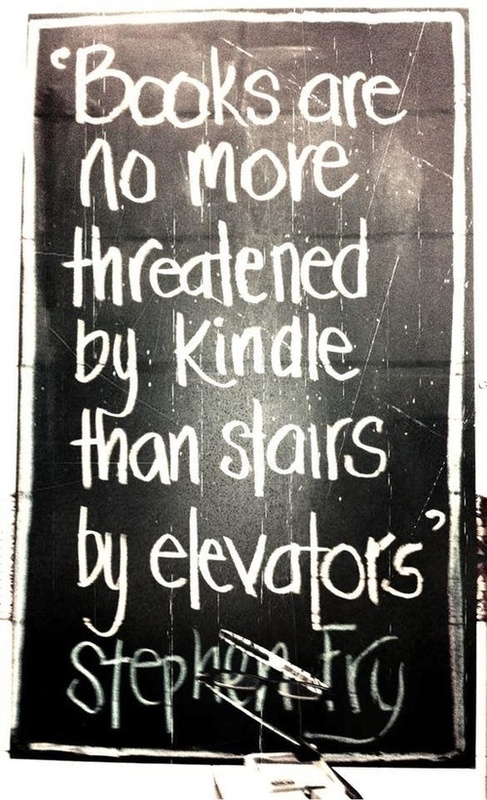 Even those who hate e-books with a burning passion and swear they will never ever buy a Kindle or Nook would be forced to if all the physical books in the world were suddenly destroyed. Why? Because readers can live without physical books, but they can't live without reading. The thing is, readers will always read. There are many reasons why people are drawn to fiction: as an escape from the drudgery of regular life, for recreation, to allow their minds to become one with a fantastical and make-believe world. The types of people who enjoy reading will always find ways to read. Sure, there are many people who don't read outside of school or work (I honestly can't figure out how they keep themselves from getting bored), but I think that the number of people like that aren't getting any larger or smaller. It has nothing to do with TV, movies, video games, the Internet or what have you. It has to do with the personality. And that goes for readers as well. That's why books will survive, in one form or another. 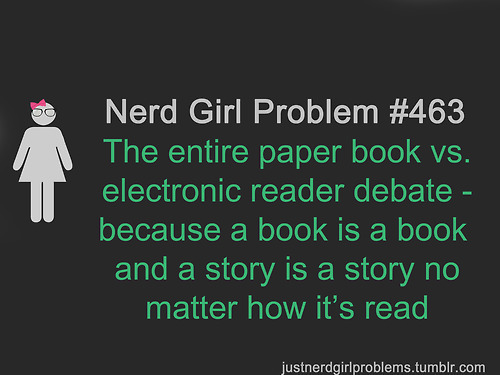 And it shouldn't matter whether you read on a screen or from a page. What matters is that the stories will still be there. Now, this also raises the interesting topic of where the future of fiction and literature is going content-wise; whether we'll end up with more unique, thought-provoking stories or books akin to Twilight and 50 Shades of Grey. That is a whole other topic, something that may be very controversial, and I'll leave that to another post. I just wanted to try to convince the people ranting about the doom of the book to set aside their blind love for the physical book and consider the e-book. Once again, I'm personally not a fan and if I can avoid reading an e-book, I certainly will. But, I don't think they are bad or good. They're just different. And the format of the book does not change the contents of the book. The story is still there, it may just look different. And the story is what truly matters. I think this will always be somewhat of a discussion :3 Personally, I do prefer to read physical books, because I like the feeling of actually turning a real page and holding the book in my hands, but I also own an e-reader. Where I live, some books are hard to come by and I don't want to have to buy every book that I can't find at the library, so that's what I use my e-reader for mostly. I think I'm in the middle of the ebook/physical debate. Like you, I love the feel of a physical book in my hand. I'm also bummed that I spent $14 on an ebook for my Kindle yesterday that my sister would love, and I can't just "hand her the book" after I'm done reading it so she can borrow it or keep it. I went to the library yesterday and checked out 14 physical books, but also bought two on Amazon for my Kindle so I have something to read (since my Kindle is always with me but I'm reluctant to take library books out of the house) when I'm waiting for my kids at their various appointments. That is is frustrating. I had to turn down an offer a family friend made me to have his Kindle for free. While ebook readers are lighter and easily to take around than books, it just wouldn't feel right for me. I think I'd miss the physical turning of the pages the most.